Once the reelected Obama administration gave the okay for the diversity industry to begin shaking down Silicon Valley like it does everybody else, we began to read over and over that the reason there are few female tech founders is because the white male power structure leaves billion-dollar bills lying on the sidewalk just to spite women. And yet, the industry’s most memorable story of recent years, as recounted in Wall Street Journal reporter John Carreyrou’s page-turning new book Bad Blood: Secrets and Lies in a Silicon Valley Startup, is how young blonde Elizabeth Holmes became tech’s pioneering female self-made billionaire (on paper) despite not quite having gone through the formality of actually inventing her breakthrough medical gizmo. As much as she courted the attention, Elizabeth’s sudden fame wasn’t entirely her doing. Her emergence tapped into the public’s hunger to see a female entrepreneur break through in a technology world dominated by men…. 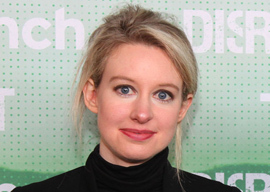 In Elizabeth Holmes, the Valley had its first female billionaire tech founder. To lend credence to her claims for her Edison blood-analyzing device, Holmes assembled a board of directors featuring a Deep State hall-of-fame lineup, including former secretaries of state Henry Kissinger and George Schultz, current secretary of defense General “Mad Dog” Mattis, and former Senate majority leader Bill Frist. Her Democrats included retired Senate Armed Services Committee chair Sam Nunn, Carter administration defense secretary William Perry, and Al Gore’s superlawyer David Boies. Investors in her Potemkin start-up included Oracle’s Larry Ellison, Mexican monopolist Carlos Slim, New England Patriots owner Robert K. Kraft, various Waltons, and Rupert Murdoch. The press baron lost his $125 million investment, but emerged with some dignity because he refused Holmes’ calls to spike Carreyrou’s 2015 exposé in his WSJ. Bad Blood will next be filmed by Will Ferrell’s pal Adam McKay (director of the Big Short mortgage movie) with Jennifer Lawrence as Holmes. It’s hard to reconcile today’s conventional wisdom that the sexes are enemy genders with how enthusiastically all these aged alpha males fell for Holmes’ self-positioning as the female Steve Jobs. It’s almost as if there will never be a final victory in the battle of the sexes because there is too much fraternizing with the enemy. Kissinger avuncularly tried to set Holmes up on dates with promising young fellows he knew, unaware that she was living with her “executive vice chairman” Sunny Balwani, a middle-aged businessman who had gotten lucky and rich in the 1990s Internet Bubble. …Sunny had elevated a group of ingratiating Indians to key positions…. For the dozens of Indians Theranos employed, the fear of being fired was more than just the dread of losing a paycheck. Most were on H-1b visas and dependent on their continued employment at the company to remain in the country. With a despotic boss like Sunny holding their fates in his hands, it was akin to indentured servitude. Sunny, in fact, had the master-servant mentality common among older generations of Indian businessmen. Employees were his minions. Balwani was Holmes’ Svengali and molded her—the innocent ingénue with big dreams—into the precocious young female startup founder that the Valley craved and that he was too old, too male, and too Indian to play himself. The reporter instead sees Holmes as the more formidable personality than Balwani, whom he dismisses as “an erratic man-child of limited intellect.” Despite her lack of inventive ability, Bad Blood recounts, she is still “an amazing saleswoman.” That seems plausible, although Carreyrou leaves unanswered the question of what in the world Holmes saw in the untalented and unpleasant Balwani, other than his faith in her destiny. Theranos’ business plan of fake-it-till-you-make-it is a venerable strategy in internet industries, but it’s not a good idea in health care. Fortunately, there is no evidence yet of anybody dying from Theranos’ dubious lab work. Still, because of the almost one million diagnoses Theranos has had to withdraw, Carreyrou notes that several patients were rushed to the emergency room in panic when Theranos’ inept devices reported they were dying, only to be sent home when their old-fashioned blood tests came back fine. So think about a typical annual checkup with your doctor. First, a nurse takes your blood pressure and some other vital signs. Then your doctor comes in and, among other matters, discusses your latest blood pressure with you. It would be much better if blood testing were as quick and easy as blood-pressure testing. But blood sampling today happens in the reverse order. At your appointment your doctor gives you an authorization to get your blood drawn. You go to another office, and there a phlebotomist sticks a needle into a vein in your inner elbow or wrist and drains out a few vials of your blood. Then a few days later the results are finally ready. However, you aren’t going to see your doctor for another year, so unless something threatening is evident, you generally don’t have much opportunity to review your latest results with him until your next appointment in twelve months. It’s a hell of a way to run a railroad.